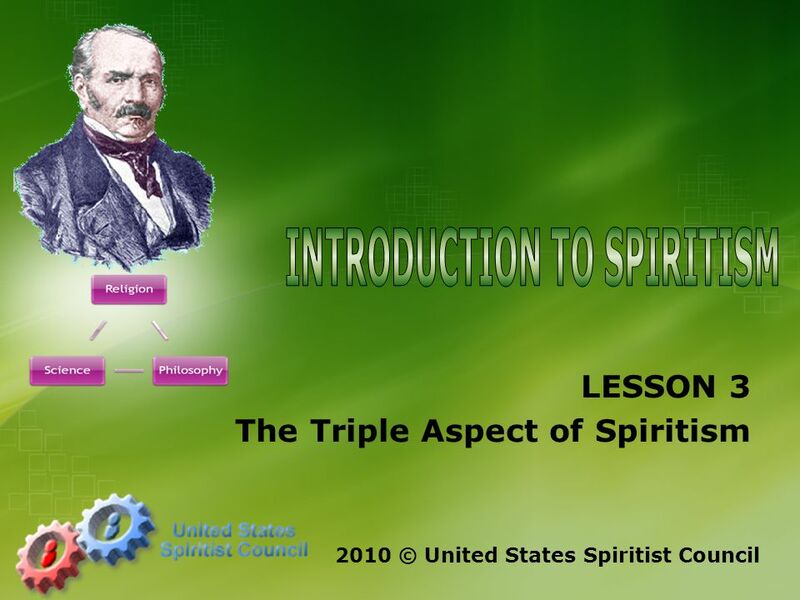 LESSON 3 The Triple Aspect of Spiritism 2010 © United States Spiritist Council. 4 Great questions about the soul remained under a veil of mystery and dogma for a long time. 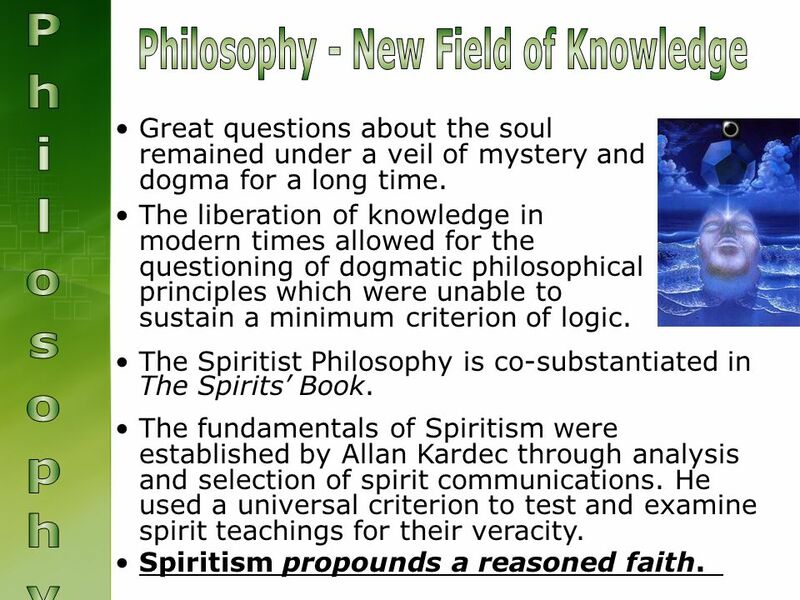 The fundamentals of Spiritism were established by Allan Kardec through analysis and selection of spirit communications. 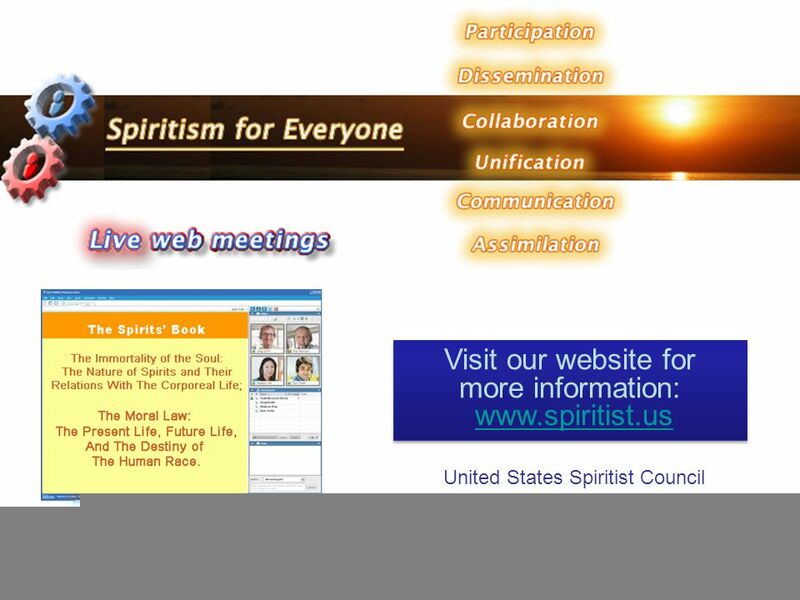 He used a universal criterion to test and examine spirit teachings for their veracity. 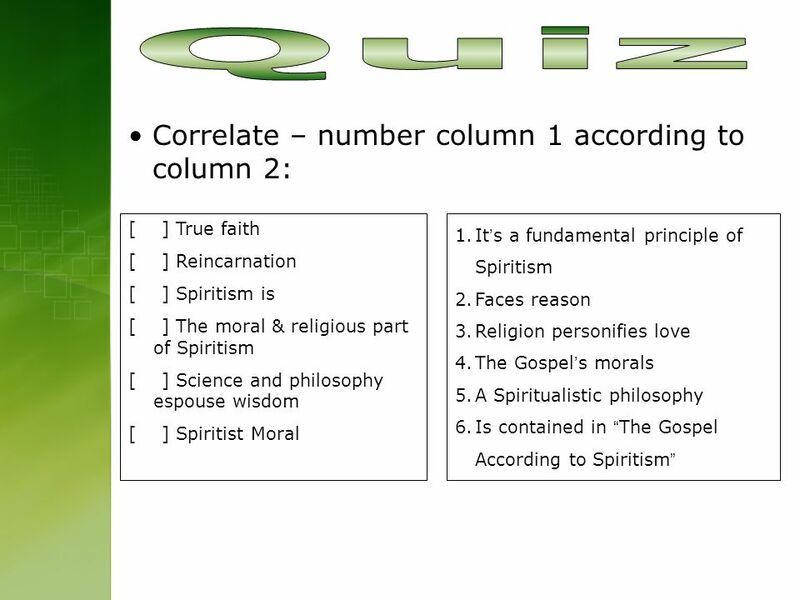 Spiritism propounds a reasoned faith. The liberation of knowledge in modern times allowed for the questioning of dogmatic philosophical principles which were unable to sustain a minimum criterion of logic. 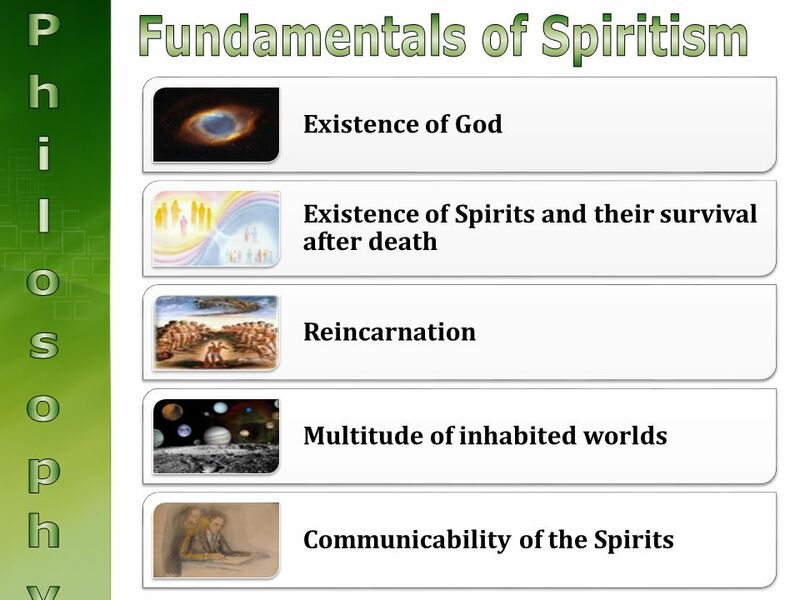 The Spiritist Philosophy is co-substantiated in The Spirits’ Book. 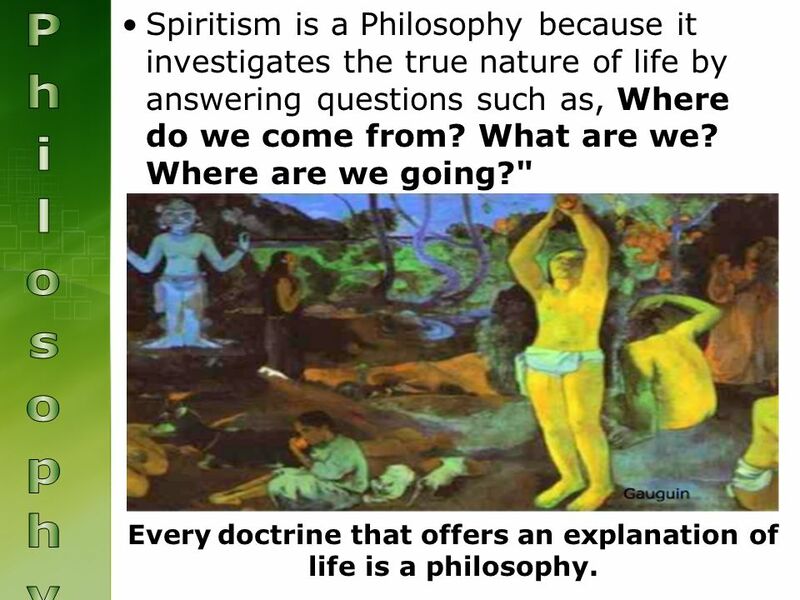 6 Spiritism is a Philosophy because it investigates the true nature of life by answering questions such as, Where do we come from? What are we? Where are we going?" Every doctrine that offers an explanation of life is a philosophy. 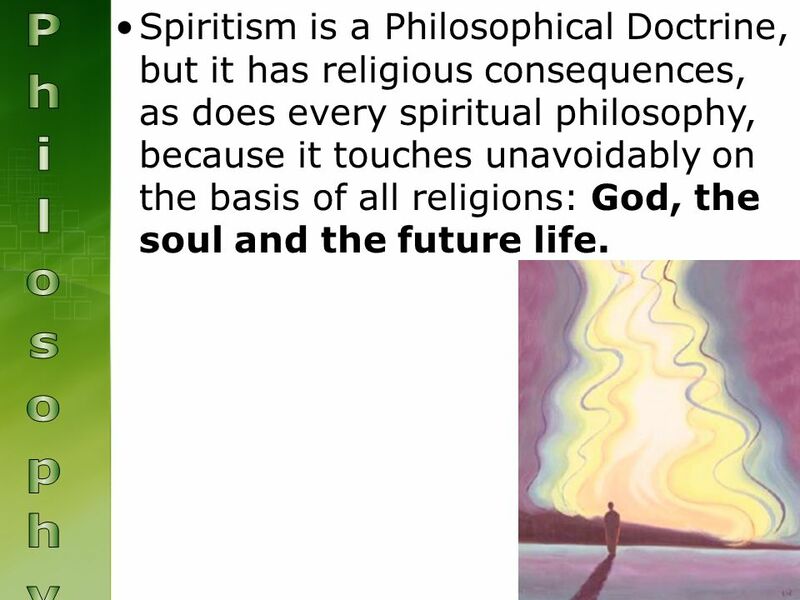 7 Spiritism is a Philosophical Doctrine, but it has religious consequences, as does every spiritual philosophy, because it touches unavoidably on the basis of all religions: God, the soul and the future life. 8 Mediumistic phenomena are as ancient as humans on the face of the earth. They have always called attention to the existence of spiritual life. 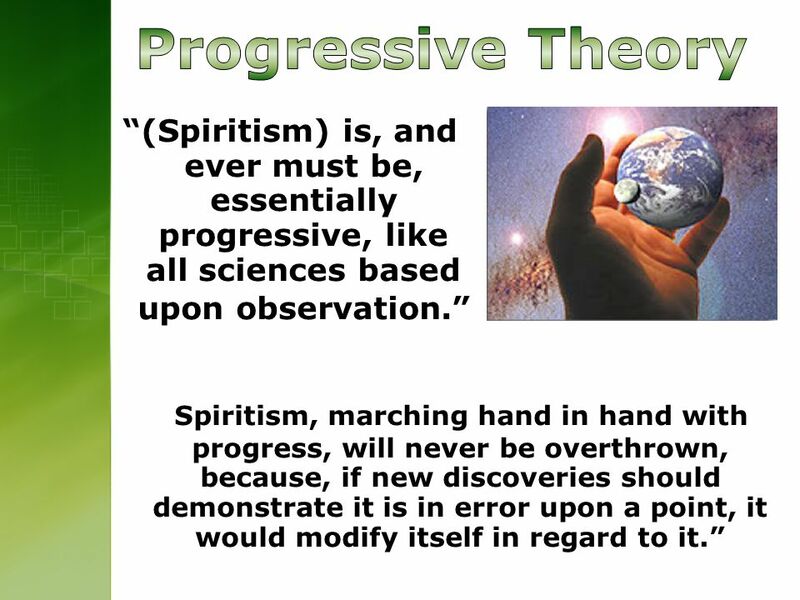 Spiritism appeared at a time of liberation and intellectual maturity. It was developed the same way that positive sciences were, by applying experimental methodology. 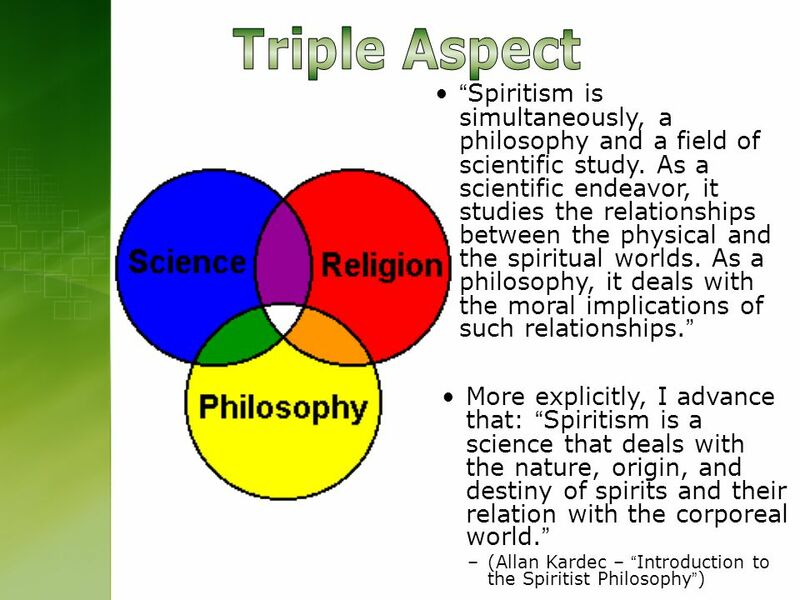 Experimental Spiritism studied the properties of the vital principle and demonstrated that spirit exists. 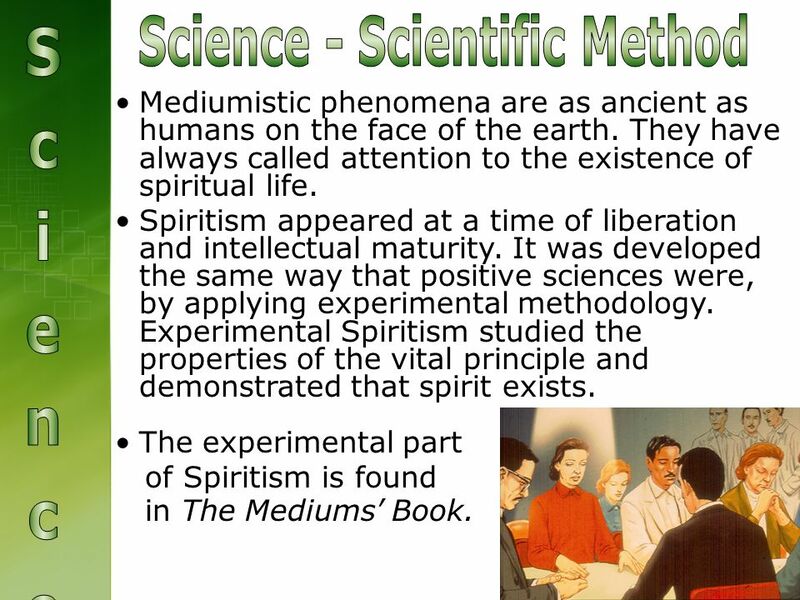 The experimental part of Spiritism is found in The Mediums’ Book. 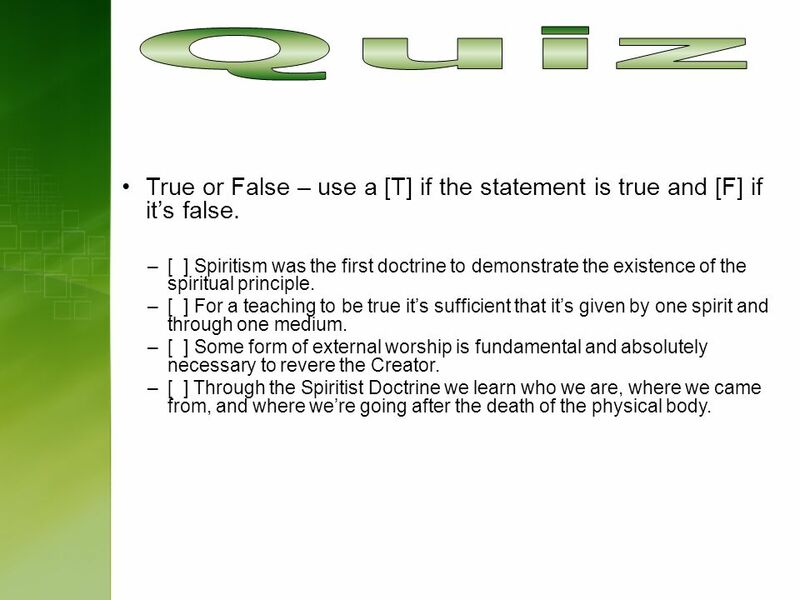 9 The same applies to Spiritism. It would not have had credibility without the confirmation by Science. 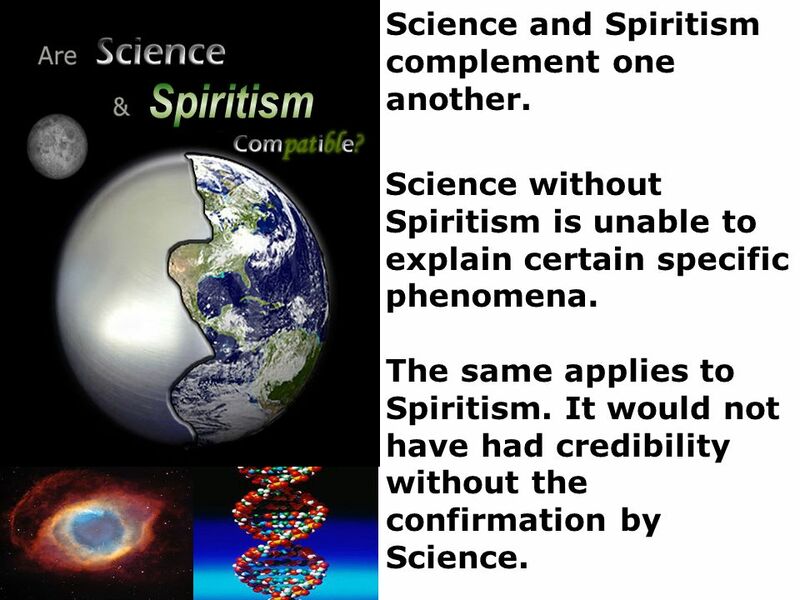 Science and Spiritism complement one another. 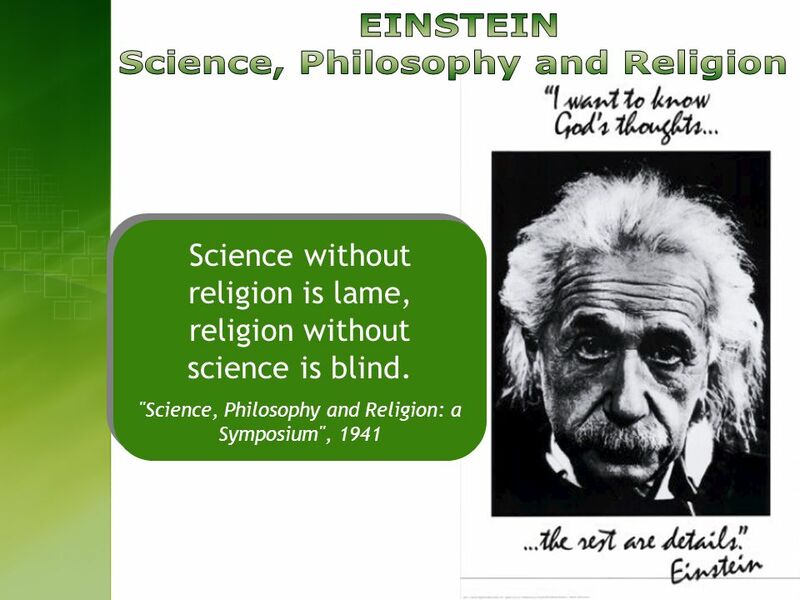 Science without Spiritism is unable to explain certain specific phenomena. 10 When primitive people could not explain natural phenomena they attributed them to superior powers which they began to revere and thus primitive worship started. 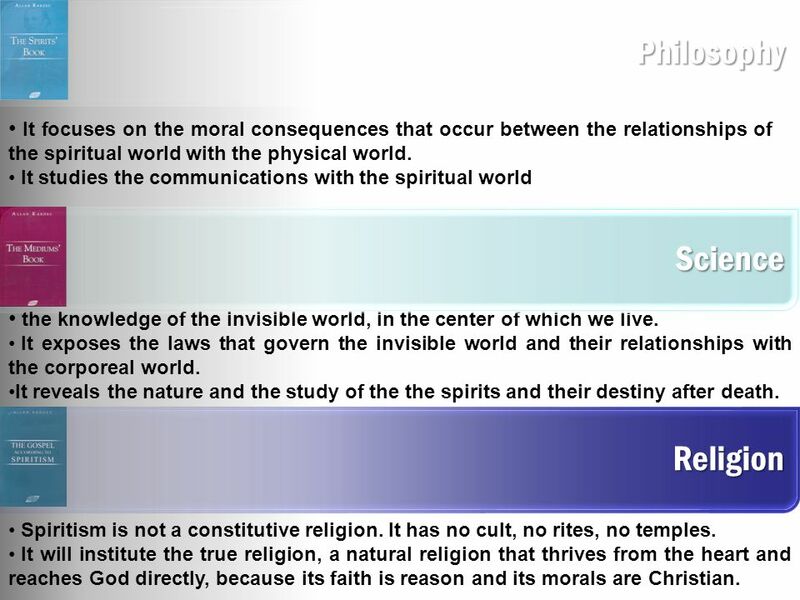 Spiritism is not a constitutive religion. It has no external forms of worship, nor clergy, or liturgy, and among its followers no one person is designated as head in charge or priest. It understands that the basic function of religion is to connect creation to its creator and that this occurs within ourselves independent of external acts. 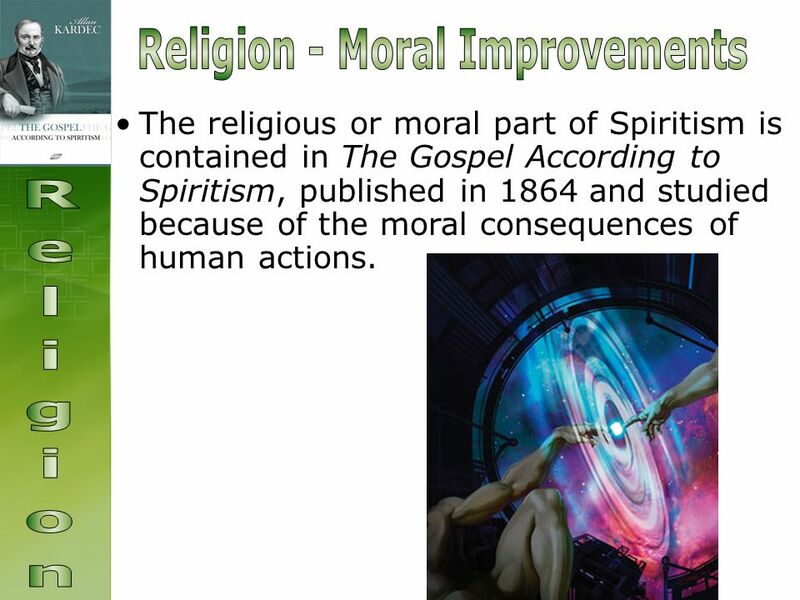 11 The religious or moral part of Spiritism is contained in The Gospel According to Spiritism, published in 1864 and studied because of the moral consequences of human actions. 12 123 Spiritism is considered the Third Revelation from God to humanity. The first was through Moses, ONE GOD AND JUSTICE. The second came through Jesus; he brought us THE LAW OF LOVE. Jesus promised that a Consoler would be sent in the future - THE SPIRITIST DOCTRINE. 18 True or False – use a [T] if the statement is true and [F] if it’s false. 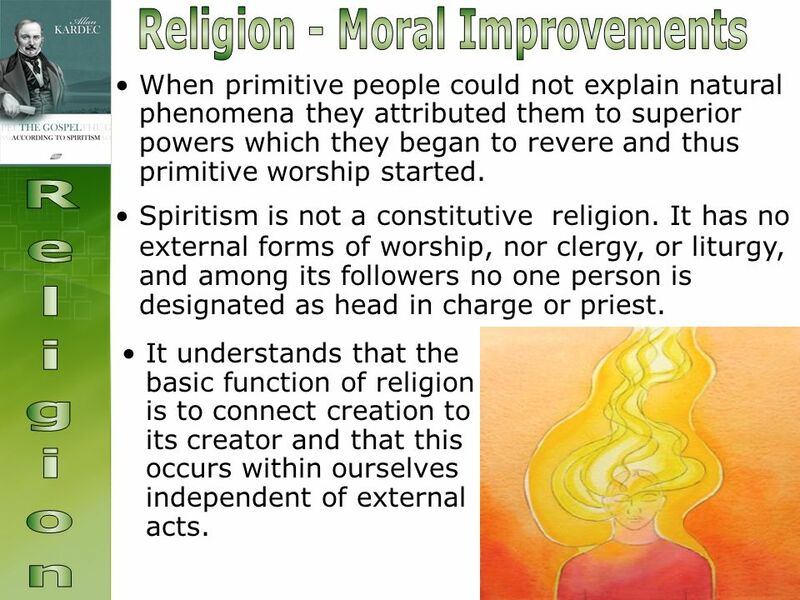 –[ ] Spiritism was the first doctrine to demonstrate the existence of the spiritual principle. –[ ] For a teaching to be true it’s sufficient that it’s given by one spirit and through one medium. –[ ] Some form of external worship is fundamental and absolutely necessary to revere the Creator. –[ ] Through the Spiritist Doctrine we learn who we are, where we came from, and where we’re going after the death of the physical body. 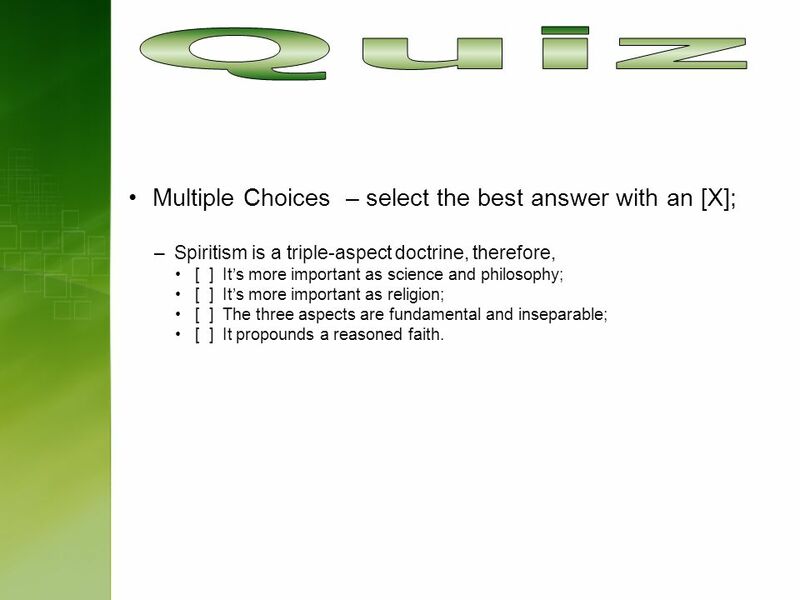 19 Multiple Choices – select the best answer with an [X]; –Spiritism is a triple-aspect doctrine, therefore, [ ] It’s more important as science and philosophy; [ ] It’s more important as religion; [ ] The three aspects are fundamental and inseparable; [ ] It propounds a reasoned faith. 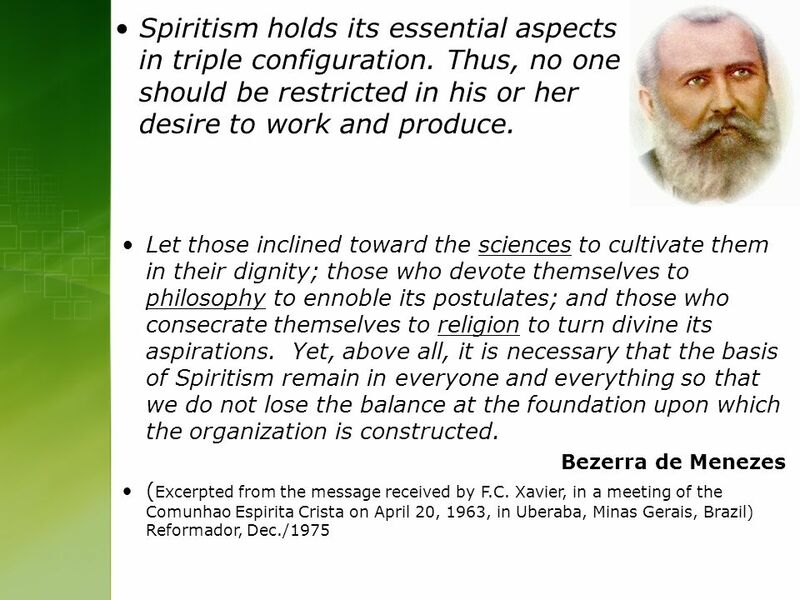 Download ppt "LESSON 3 The Triple Aspect of Spiritism 2010 © United States Spiritist Council." A PEEK INTO ETERNITY WHILE STILL ON EARTH.. THIS IS NOT A PREACHING TOUR. NOR IT IS MY INTENTION TO CHANGE YOUR BELIEFS OR CONCEPTIONS. SIMPLY, I WOULD. 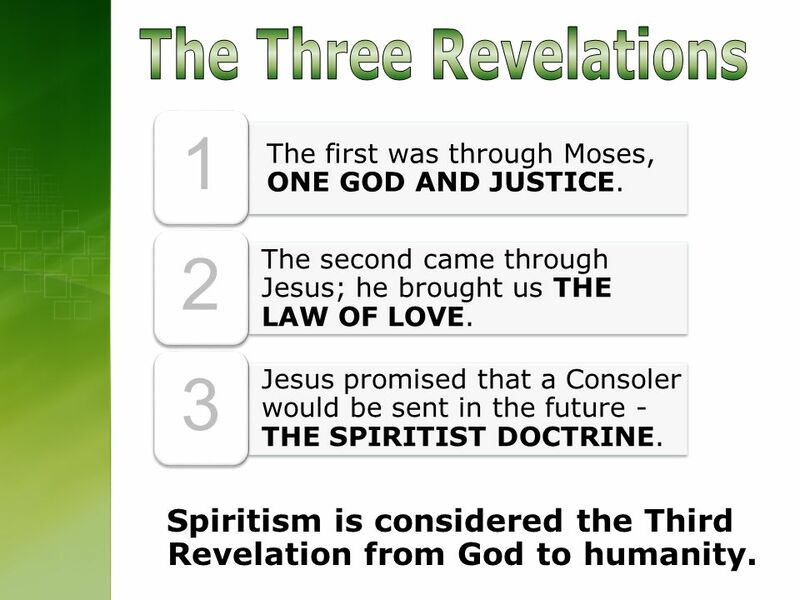 The Third revelation Spiritism. 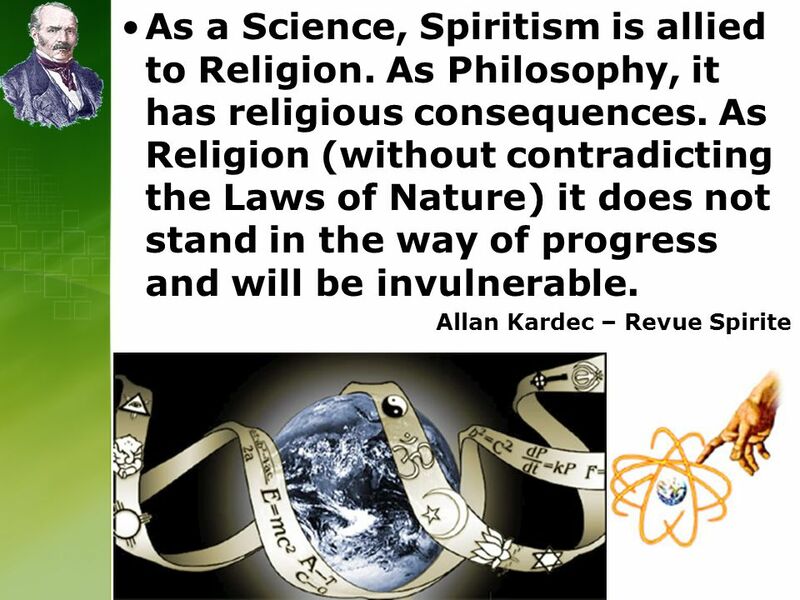 The Third revelation: Spiritism What is Allan Kardec’s real name? A - Hippolyte Léon Denizard Rivail B - Allan Hippolyte. Genesis on a laptop God’s operations from the beginning. CHRISTIAN DOCTRINES What We Believe and Why. Word of God Four characteristics Authority Clarity (understandability) Necessity (why we need it) Sufficiency. MTH 513 Marriage, Family and Sexuality Introduction. What does the Real Presence mean?. Jesus promised he would always be with us. Jesus fulfilled that promise by giving the Church the gift of his Real Presence. Letter for the Feast of the Sacred Heart  God gives us the means necessary for living and carrying out our mission  The economy is a basic dimension. What does it mean to have faith? Faith is a Human Characteristic Faith shapes our lives, our choices, our relationships and our commitments. Faith is. 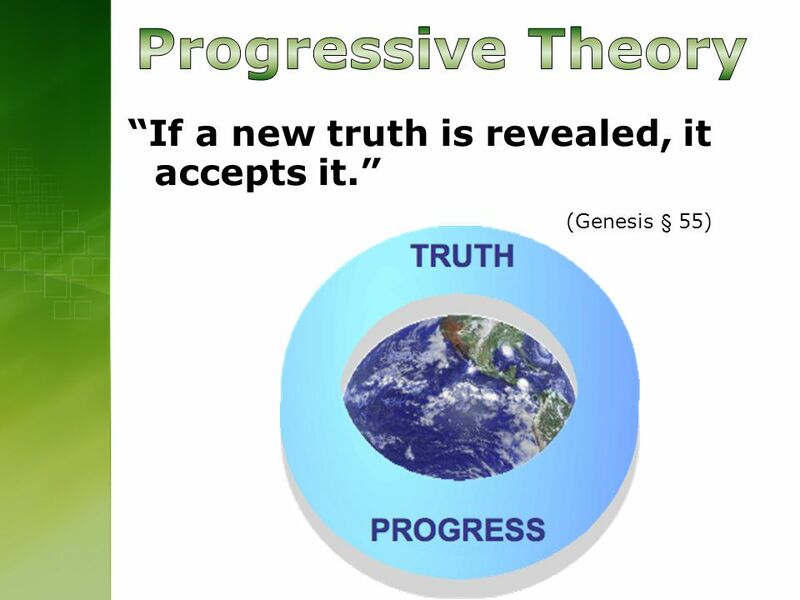 Thomas Paine and the Spiritist Thought By Luis Salazar, Jr. April 2008.